Associate Professor David Leung from the University of Canterbury in New Zealand has been awarded Government funding to investigate the potential of 3D printing live plant cells for creating synthetic wood. Associate Professor David Leung in a plant tissue culture growth room at the School of Biological Sciences at the University of Canterbury. The $255,000 funding – to be delivered over three years – will help Professor Leung create new synthetic wood manufacturing industry through 3D bio-printing live plant cells that could greatly reduce the need for tree harvesting. Professor Leung said his project – Enabling sustainable economic development with advanced additive manufacturing of wood – could unlock enormous economic potential in harnessing the enabling 3D-printing technology in product manufacturing. “Although challenging, there is potential to use live cells as an advanced manufacturing material in a yet-to-be invented, new industry,” Mr Leung said. He said the project’s main objective was to manufacture a non-living 3D structure that would act as replacement for wood and put an end to the destructive harvesting of trees. “Live eucalyptus tree cells will be prepared specifically for bio-printing. 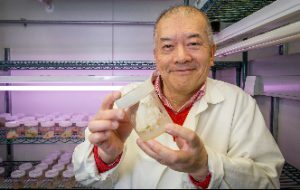 They will be physiologically primed in a 3D structure in the biotech lab at the University of Canterbury, without any genetic modification, to be capable of responding to the appropriate triggers for transformation into a principal wood cell called a tracheid,” Professor Leung explained. If successful, the research will be one of the most significant scientific advances towards the realisation of the potential of 3D printing, providing manufacturers with a new, sustainable and advanced biomaterial for developing niche products.